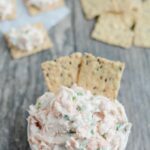 This Easy Smoked Salmon Dip recipe is the perfect appetizer for your next party. It’s quick, easy and full of flavor and also makes a great snack! Combine cream cheese, yogurt, horseradish and green onions in a bowl and mix until well combined. Place salmon in a food processor and pulse several times. Stir salmon into cream cheese mixture.